Vermeil Vs. Gold Plated Vs. Gold Filled - Which is Better? There’s a big difference between these three. Some jewelry lovers assume the terms vermeil, gold plated and gold filled are interchangeable, but these jewelry categories actually vary in very important ways. Of course, each type has a gold layer on the surface, so it’s easy to confuse them. While the presence of gold definitely makes each type more valuable and durable than costume jewelry, you’ll want to carefully consider the qualities of each before choosing which to add to your wardrobe. First, let’s go over the basic definitions of each, and then we’ll compare them and explore how you can decide which is the best for you. Vermeil, also known as “silver gilt”, refers to high quality (pure or sterling) silver that is plated with a thin layer of gold. Most vermeil jewelry available now is created by electroplating the silver with gold, a chemical process that uses an electrical current to bind the two metals together. In order to be considered as true vermeil jewelry in the US, the piece has to meet certain qualifications. For instance, the gold on the piece needs to be at least 2.5 microns thick, and at least 10k or higher. Gold plated jewelry is a brass, copper, or low-end metal electroplated with a layer of gold. 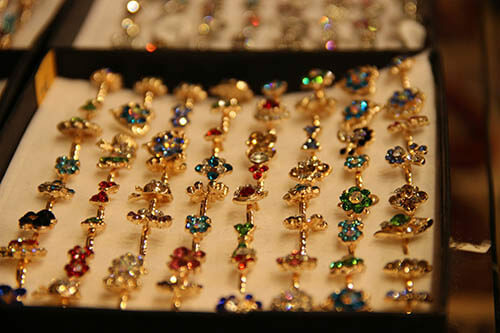 Usually less expensive than vermeil, gold plated jewelry doesn’t require any minimum karat weight or thickness. That being said, a gold plated piece can potentially be more valuable than a vermeil piece if it has a high gold karat weight (20 or 22k) and a thick layer of gold. Unlike vermeil and gold plated jewelry, gold filled jewelry has a much thicker layer of gold over the base metal, sometimes as much as 100% thicker. This makes a big difference in terms of the jewelry’s ability to resist wear and tear long term. Although the base metal is usually brass or another low-end material, it would be hard to tell the difference between “real” gold and a gold filled piece. 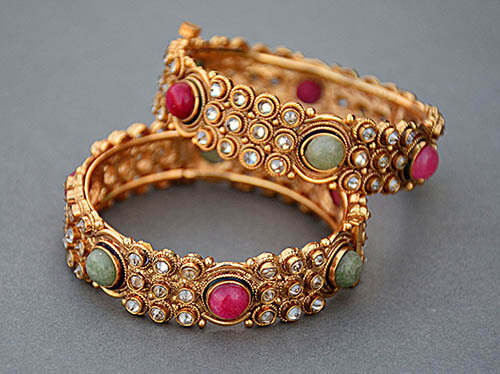 As vermeil jewelry is composed of two precious metals (gold and silver), it’s usually thought of as being closer to fine jewelry and tends to fall under the category “demi-fine.” The higher the karat weight and thickness of the gold layer, the more expensive and valuable the piece will usually be. However, if a vermeil ring or necklace only has the minimum layer of gold, it’s likely to start wearing away soon after purchase. At the very least, a thinly plated vermeil place will need a replating every so often. Essentially, gold plated jewelry is the same thing as vermeil jewelry, only the base metal is of a lower quality than silver, such as copper or brass. In contrast to vermeil, there are no specific requirements for gold plated jewelry. The gold can be of any quality, and the electroplated layer can be any thickness. In general, unless specified otherwise, gold plated jewelry is usually going to have lower quality gold and a thinner gold layer. Because of this, as a consumer, it’s important to pay close attention to the jewelry’s quality if it’s listed as gold plated. While it does have a layer of gold, this doesn’t necessarily mean the jewelry is high-quality and durable! While gold plated jewelry is usually not an ideal choice, gold filled jewelry can be a high-quality addition to your collection. Gold filled jewelry isn’t created through electroplating, but rather through bonding with heat. Since two or three thick layers of gold cover the base metal inside, the jewelry is protected from tarnishing and discoloration. Authentic gold filled jewelry should have a minimum of 5% gold weight, so make sure the outer gold layer is at least this thick. Since vermeil pieces are usually created from electroplating and the minimum required gold is much lower, you’ll want to keep this in mind when trying to decide between vermeil and gold filled. Make sure to compare the gold’s karat weight, the thickness of the layer and the quality of the base metal. By looking at the individual qualities of the piece, you’ll be able to determine if it matches your standards. While certain vermeil pieces can tarnish easily, others with thick plating may last as long as a gold filled piece. If you happen to have allergies to lower base metals like brass, copper or nickel, it’s best to either choose vermeil jewelry or gold filled jewelry. 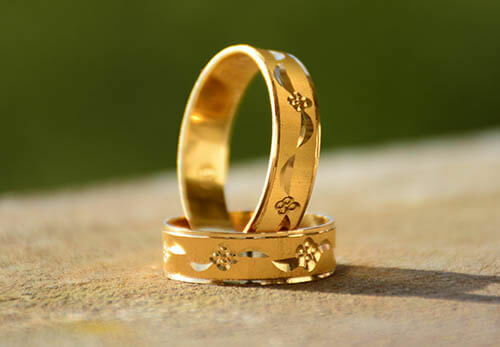 The gold layer on plated jewelry is usually too thin to cover the lower metal, and if any gold begins to wear down, you might get an allergic reaction. So Which Type of Jewelry Should I Choose? If you’re looking for the highest-quality, demi-fine jewelry, a vermeil collection with thick plating in 18k gold would be a good choice. If you don’t mind a lower base metal, gold filled pieces are probably your best bet when it comes to long-lasting and durable jewelry. Although gifts for loved ones, bridal jewelry and commemorative pieces are all best suited as vermeil, gold filled or fine jewelry, your casual fashion wear can work great with just a thin layer of gold plating. While pure 14k or 18k gold or platinum pieces are always the best choice for high-quality, permanent pieces of your collection, vermeil and gold filled can always be a good alternative for the budget-conscious fashionista.